My way out. A series of scary and dangerous trials, of course. For my third mission, I must, journey through the labyrinth to free an oracle who only speaks in puzzles. Defeat a vicious and bloodthirsty roman emperor the most vicious of three very vicious and bloodthirsty roman emperors. Is that all. No, I've to do everything without any of my godly powers. Wonderful. Looks like I'll be needing all the help I can get. From new friends and old. Rick Riordan is the author of the 1 new York times bestselling Percy Jackson and the Olympians series for children and the multi-award-winning tres Navarre mystery series for adults. For fifteen years, rick taught English and history at public and private middle schools in the san Francisco bay area and in Texas. In 2002, saint Mary's hall honoured him with the school's first master teacher award. His adult fiction has won the top three national awards in the mystery genre the Edgar, the Anthony and the shamus. His short fiction has appeared in Mary Higgins Clark mystery magazine and Ellery queen's mystery magazine. 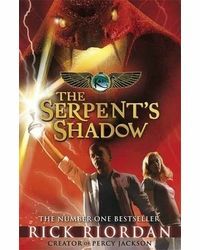 His Percy Jackson series features a twelve-year-old dyslexic boy who discovers he is the modern-day son of a Greek god. The lightning thief was a new York times notable book for 2005. Film rights have been purchased by twentieth century fox and a feature film is in development. The sea of monsters was a child magazine best book for children for 2006 and a publishers weekly and book sense national bestseller. The third title, the titan's curse, made the series a #1 new York times bestseller and the fourth title, the battle of the labyrinth, had a first printing of one million copies. Rick is also the author of the 39 clues, the maze of bones, another 1 new York times bestseller. Film rights for the 39 clues have been purchased by Steven Spielberg and dream works. 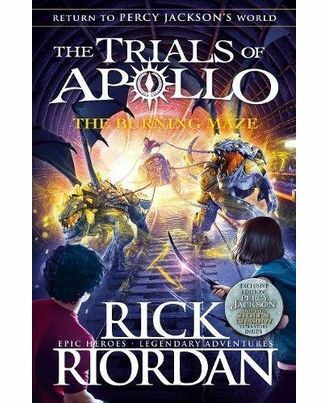 Rick Riordan now writes full-time. He lives in san Antonio with his wife and two sons. About the Book :I was a god, once. Until I was cast out by my father, Zeus.Now I'm an awkward mortal teenager called Lester. My way out. A series of scary and dangerous trials, of course. For my third mission, I must, journey through the labyrinth to free an oracle who only speaks in puzzles. Defeat a vicious and bloodthirsty roman emperor the most vicious of three very vicious and bloodthirsty roman emperors. Is that all. No, I've to do everything without any of my godly powers. Wonderful. Looks like I'll be needing all the help I can get. 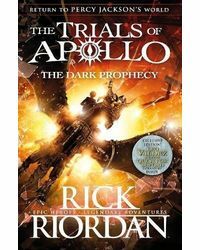 From new friends and old.About the Author :Rick Riordan is the author of the 1 new York times bestselling Percy Jackson and the Olympians series for children and the multi-award-winning tres Navarre mystery series for adults. For fifteen years, rick taught English and history at public and private middle schools in the san Francisco bay area and in Texas. In 2002, saint Mary's hall honoured him with the school's first master teacher award. His adult fiction has won the top three national awards in the mystery genre the Edgar, the Anthony and the shamus. His short fiction has appeared in Mary Higgins Clark mystery magazine and Ellery queen's mystery magazine. 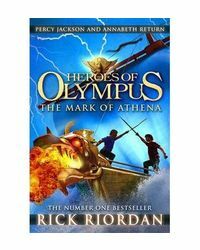 His Percy Jackson series features a twelve-year-old dyslexic boy who discovers he is the modern-day son of a Greek god. The lightning thief was a new York times notable book for 2005. Film rights have been purchased by twentieth century fox and a feature film is in development. The sea of monsters was a child magazine best book for children for 2006 and a publishers weekly and book sense national bestseller. The third title, the titan's curse, made the series a #1 new York times bestseller and the fourth title, the battle of the labyrinth, had a first printing of one million copies. Rick is also the author of the 39 clues, the maze of bones, another 1 new York times bestseller. Film rights for the 39 clues have been purchased by Steven Spielberg and dream works. Rick Riordan now writes full-time. He lives in san Antonio with his wife and two sons.